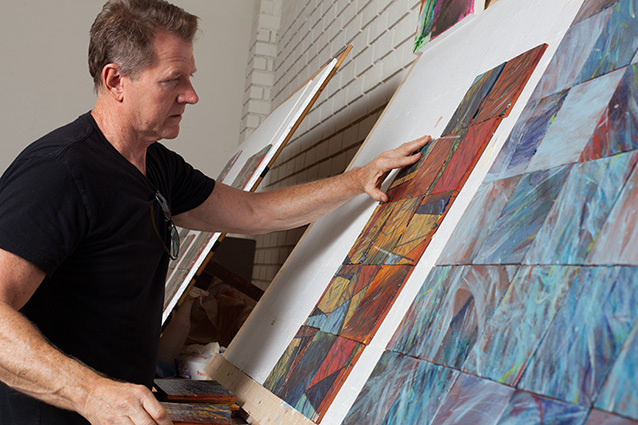 Los Angeles, CA, January 30, 2015 — Arto Brick, Southern California-based creators of hand-crafted tiles, brick veneer and pavers for residential, commercial and public applications, announces a unique collaboration with acclaimed local visual artist David Shipley. Since 1966, Arto Brick’s in-house artisans have been hand-crafting small batches of product made from locally sourced clay and concrete. Unlike mass-produced, machine-made products, every Arto brick veneer, tile, and paver offers its own unique texture, color, variation and human warmth. Arto’s ongoing collaboration with critically acclaimed painter and sculptor Shipley reflects the company’s passion for creating products that are as beautiful and as individual as they are functional. Shipley is now working with Arto Brick to create an exclusive collection of textured tiles, ceramic paintings, tableware and a range of household items featuring the artist’s recognizable interplay of vibrant color, movement and emotion. To view the David Shipley Collection, call (310) 768-8500 or email info@artobrick.com to schedule a personal tour. Founded in 1966 by Arto Alajian — an industrial designer with an artist’s heart — Arto Brick’s story began in a small studio equipped with a single kiln. Nearly 50 years later, Arto floors, walls and hardscapes can be found breathing life and warmth into distinctive living spaces across the country. While Arto’s product lines and collections have continued to evolve, and its reach has continued to grow, the family-run operation still shares the same passion that went into the very first brick veneer that came out of its kiln: To create extraordinary, unique and beautiful products that become a part of the living spaces they enhance. Today, Arto Brick continues to hand-craft small-batch ceramic and concrete tiles, brick veneers and pavers from their Gardena, CA headquarters, using locally sourced materials and adopting environmentally responsible practices. No two Arto Brick products are the same, and each one delivers its own Rustic Elegance that comes from having been crafted by artisans rather than machines. Even as a child growing up in Lubbock, TX, David Shipley never stopped drawing and painting. Focused on establishing himself as a skilled painter and sculptor, his formal art training included studying at the Cornish School of the Arts, the University of Texas/Austin, Texas Tech University/Lubbock, and Cal State/Long Beach. Now a California Artist, Shipley’s work strives to harness the visceral impact of abstract art so that it might best express his personal outlook on life. Shipley has long been fascinated by color contrasts and their ability to invoke reaction and incite emotion. By applying a vibrant color scheme to his intense paintings and sculptures, his quixotic artwork is often somehow both kinetic and soothing at the same time. Exhibiting since 1980, Mr. Shipley has had a dozen solo exhibitions and has participated in more than fifteen group shows. He maintains a studio in Southern California and has recently introduced a full line of dynamic ceramic paintings into the repertoire of his work. Learn more at DavidShipley.net.